The Preserve is a rare community that lives in harmony with its natural surroundings. The 45-acre Marjorie Perry Nature Preserve is the centerpiece of the neighborhood. Home to wildlife and waterfowl, nature flourishes here. Walking and biking trails extend along the Highline Canal as it runs 1.5 miles through The Preserve on its 70-mile course through Denver. Expansive mountain views and one- and two-acre home sites invite residents to come home to majestic open spaces in close proximity to all the conveniences of the city. Located only 15 minutes from Downtown Denver and five minutes from the thriving business core of the Denver Tech Center, the community is surrounded by established neighborhoods, shopping and conveniences, with Littleton public schools and several private and parochial schools in the vicinity. Nearby recreation includes six public and private golf courses, the Greenwood Village Athletic Club and the Cherry Hills Village Equestrian Center. The Koelbel Library, the central facility for the Arapahoe County Library system, is just across the street. The community’s own flourishing neighborhood association plans annual events and activities that bring the community together on a regular basis. Buyers choose their own home site and work with an approved builder on a plan of choice. Buz Koelbel, President/CEO of Koelbel and Company, and his team personally selected the participating builders— eight (8) firms chosen from a competitive field of applicants that underwent an extensive application and selection process. Homes are built according to strict design guidelines and complement their environmental surroundings with neutral colors and natural materials. We’ve saved the best for last. 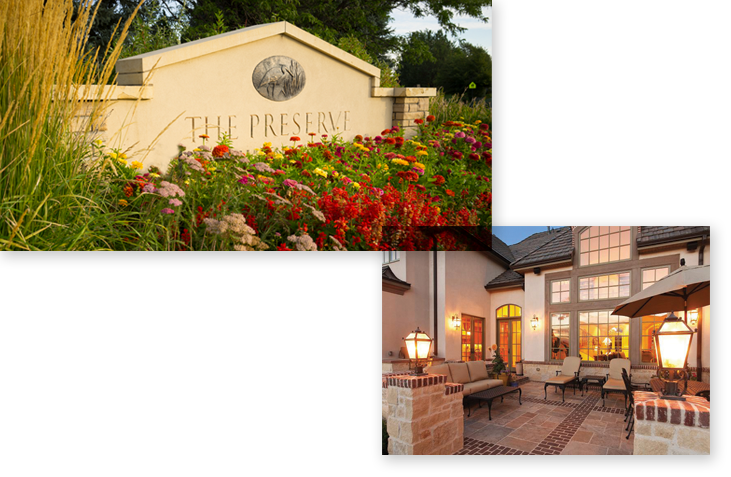 The Preserve’s Final Phase is comprised of the finest one- and two-acre lots ever offered. Several are adjacent to the Highline Canal with unspoiled vistas of the Front Range. The Preserve is full of rich history that dates back to 1936 when Marjorie Perry, a devoted preservationist, purchased the 200 acres of land that The Preserve now stands on. She had a desire to build a farm outside of downtown Denver, and after purchasing the land, she frequently rode her horse from the bustling western city to the beautiful site. She dreamt of the day she could build a home and permanently live on the farm. Then, as now, the parcel of land that Perry selected was captivating with majestic mountain views and teeming with wetland wildlife. Now, 25 years after its first homes were introduced, The Preserve can look back on one of the most remarkable sales successes of any luxury residential property in Colorado. More than 95 percent complete, just a few opportunities remain to be a part of this magnificent neighborhood. Unlike other developers who were introducing upscale neighborhoods to the marketplace in the late 1980s, Koelbel avoided the temptation to create a walled-in enclave that would shut residents off from the surrounding community. Rather, The Preserve would be a wide-open experience, its natural beauty – dedicated open space totaling almost 124 acres – accessible to outsiders via trails and bridges.